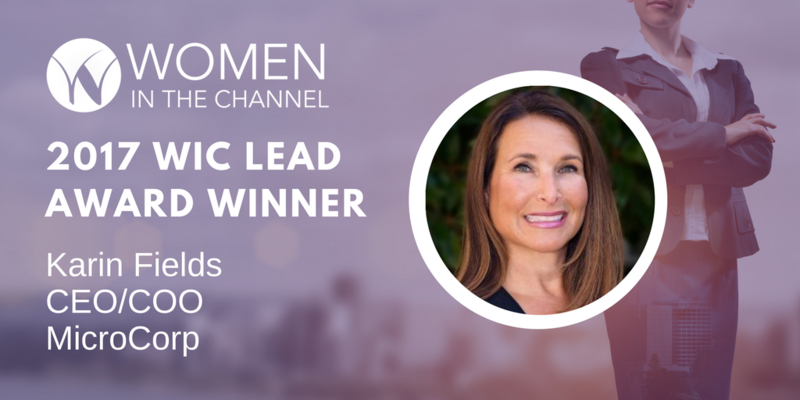 Karin Fields, CEO/COO of Microcorp, was one of five women to receive the inaugural Women in the Channel LEAD Award recognizing exceptional female leaders in the tech channel. WiC LEAD Award winners were honored at a ceremony during the 14th Women in the Channel WiCConnect Networking Event, September 25, in Austin during Channel Partners Evolution. Karin has more than 20 years of industry experience. With MicroCorp since 1994, Karin is now responsible for leading the company’s operations and culture. Past: Who is the woman who showed you how to lead the way (e.g., your role model)? Early in my career I had the pleasure of working for two strong women: Linda Hernandez and Michelle Anderson. Both were no-nonsense, women of action. They taught me to take a step back and look at the big picture – not just the problem, but what caused the problem, so you won’t have to deal with the same issue again. Both also encouraged everyone on their team to have a voice and share suggestions and ideas. Present: What are you doing to lead the way for other women in the tech channel today? At MicroCorp we actively promote from within. Our Director of Operations is a woman who has been promoted several times. Most of our supervisors are women who have been promoted from within. I am very committed to helping people reach their goals. I have also mentored several women over the years. Lastly, MicroCorp has been a Diamond sponsor of Women in the Channel for several years. Future: What is one thing we could accomplish that would most benefit women in the tech channel going forward? Being in technology gave me the flexibility I needed to have the career I wanted and be the hands on mom that was important to me. That is what I would love to see for every woman: the ability to have the quality of life they want. Helping women become more technical-oriented will help them have the options that they want.